many cartoons Nick has carried over the years, it's the only one so far to have been spun off into a separate animated series. Nick celebrated its #1 show's tenth anniversary on July 21, 2001, by showing how the characters would be if they'd aged like real kids, and were now approaching (or even past) puberty. 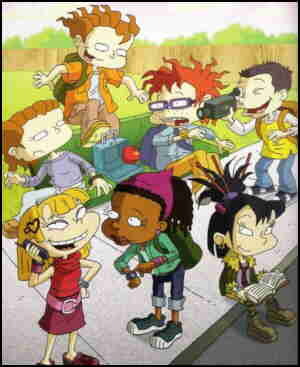 Rugrats: All Growed Up was about the Rugrats babies hitting adolescence. Their parents were well into middle age, their grandparents were even older, and the kids themselves had long since left babyhood behind. But they were still the same sort of people they always were. Chuckie was still afraid of everything, Tommy was still a creative genius, and Angelica  Angelica was still Angelica. The anniversary special went over so well, before long the possibility was raised that it might become a regular series. Production work began in 2002, and next thing you know, Nick was plugging it under the slightly modified title All Grown Up. As a series it began November 29, 2003; but it was previewed in another special. Nick aired the preview on April 12 of that year. Voice actors tended to reprise their roles, both in the specials and in the series. Tara Strong (Timmy in Fairly OddParents) was Dil Pickles; Cree Summer (Elmyra Duff) was Susie Carmichael; Joe Alaskey (current voice of Bugs Bunny) was Grandpa Pickles; etc. The Klasky-Csupo studio, which was also responsible for The Wild Thornberrys and Stressed Eric, made a total of 55 episodes by 2006, when production stopped. Nickelodeon showed the last of them by 2008. Those episodes can still be seen in the form of reruns. They're also available on home video. In addition, about a dozen books about the characters are available, as are toys, T-shirts, coloring books, and all the usual media exploitation of what's become another hot property. Text ©2009 Donald D. Markstein. Art © Nickelodeon.